Fully Automatic Robotic Vacuum Cleaner [Automatic Robotic Vacuum Cleaner] - $139.95 : NewDaVincis.com!, Great Innovative Products, Gadgets and more. 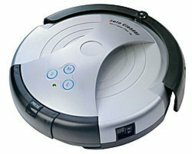 Robotic Intelligent Automatic Vacuum Cleaner is a fully automatic and smart cleaner for all floor surfaces. 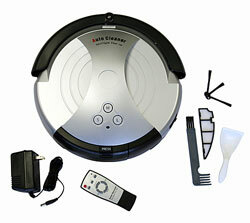 It will sweep and vacuum from carpet to hardwood to tile automatically. It goes under beds and other places where upright vacuums can't go to clean dirt, dust, and pet hair. It works for about 60 minutes before needing to be recharged. Smart sensor at the bottom prevents the cleaner falling down steps or elevated surfaces. Comes with a remote control . Safety features include: stops automatically when unit gets stuck or was picked up, comes out from dark areas and stops in better lit area once finished cleaning or when battery power is low, gives a warning sound when low on power. Easy to use and clean. Charging time is about 4 hours. LED Indicator will show when it is fully charged. Package includes: Intelligent Cleaner, Remote Control, Battery Charger, Filter, Rechargeable Battery, Cleaning brush, and side rotating brush replacement. No time and wasting effort to vacuum the surfaces which couldn?t be reached. This product was added to our catalog on Tuesday 09 October, 2007.